Olive oil skin care is pursued by those individuals who are looking for a natural way to take care of their skin. There are many products manufactured with artificial ingredients for skin care. Some of these are great because they target specific skin problems. However, many of these products are cheaply made with poor quality ingredients and often do not do anything to promote proper skin health. In addition, such products may do more harm than good. For this reason, many people are looking at the use of olive oil and olive oil skin products as a natural way to make and keep their skin healthy. Olive oil benefits for the body are well advertised, but what about the olive oil benefits for the skin? As a bath oil. Substitute regular bath oil with a couple of tablespoons of olive oil and see the difference on your skin. As a skin moisturizer. Apply olive oil to dry skin on any body part (face, elbows, feet, etc.) to help the skin regain its natural oil balance. Olive oil can be added to many of the natural facial home recipes that exist. When combined with some sugar, olive oil makes a great hand exfoliant and moisturizer. Olive oil can be used as a lip balm, hair moisturizer, nail soak, dandruff treatment, and many other uses for healthy skin care. Some research has indicated that applying olive oil on the skin after being in the sun may help reduce the damage caused by sun exposure. Ensure this is done after being in the sun and not before, because olive oil has no SPF benefits. Other potential benefits of olive oil as an olive oil skin care product include the treatment of minor skin wounds, eczema relief, and some skin care benefits for psoriasis. The vitamin E in olive oil makes it a great overall skin care product because as you know, this vitamin provides many benefits in proper skin care. Whether you purchase olive oil skin products or mix up your own olive oil skin care homemade recipes, your skin will benefit. Always look for extra virgin olive oil or organic extra virgin olive oil in olive oil skin products or when formulating your own olive oil skincare recipes to ensure you are getting a better quality oil. 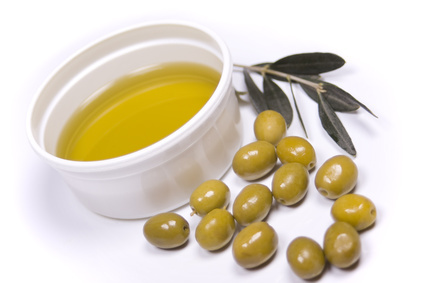 Pure or light olive oil is likely chemically processed and would be lacking the beneficial skin care elements. These products would be essentially useless when compared to good quality olive oil. Learn about wrinkle creams for the face at our wrinkle cream information page.